The Gentleman Crafter: My Thanks To Shelly Hickox! 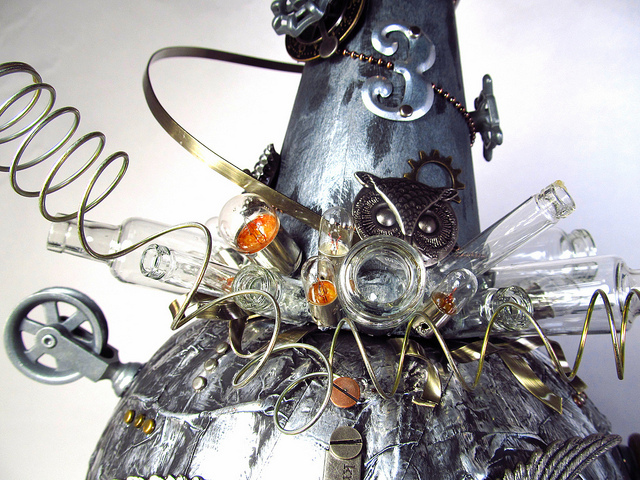 Then, on Facebook I saw a fellow Inspiration Team pal, Shelly Hickox's post on her AMAZING Steampunk'n!!!!! What a total treat for the eyes! Please go and check it out on her blog, here. See didn't I tell you it was AWESOME! I love this woman's art! I mean she makes the MOST incredible things! I'm a big fan and always will be! I always look forward to whatever she comes out with next! Shelly was just the inspiration I needed. I loved Shelly's Steampunk'n so much that I got on my happy face, got off my tail feathers and got crackin! THANK YOU SHELLY! You are one AMAZING artist. Did I already say that? If I did, it's because it needed to be said more than once! After reading her blog post, I thought to myself...I may have everything to do it. 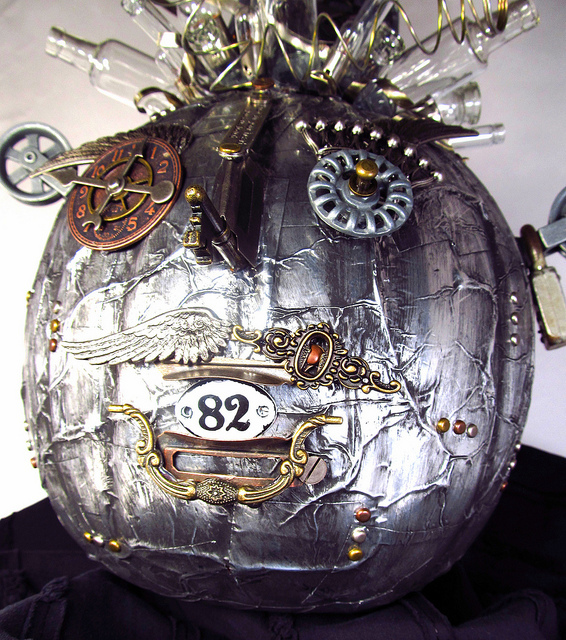 I had seen Tim Holtz do the riveted patchwork pumpkin last fall and I loved it then and bought all the things to do the project, but never got around to doing it! I hate when that happens! But at least I had the supplies. I love me some steampunk and I so miss playing with all the Idea-ology pieces from Tim, so off I went, smile on face, and Shelly's Steampunk'n for inspiration in my heart and mind. Thanks Shelly Hickox! You Rock My World! Just Too Cool!!!! Love it! Well you definitely got out of your slump! What a fantastic whimsical creation! Love it! Ps. We have killed our third scorpion this weekend! Our little Peke has become quite the scorpion "pointer"! Sorry you were feeling low this afternoon. Maybe just a bit of latent scorpion poison or venom. Luckily, I don't deal with scorpions and have limited knowledge. I was at Joanne's this afternoon, looking at the EK Success punches. The gal next to me couldn't figure out what was so funny as I started chuckling at the punch I was holding. It was a tarantula. She needs your blog address. Your steampunk'n is wonderful. I especially like how you used the vials. I assume you glued them on with glossy accents. A great Halloween decoration and a terrific comeback. I love Shelly's art too. That is totally Jacked-up! LOVE IT! That has to be one if the coolest pumpkins I have ever seen, absolutely amazing! I am a huge fan of Shelly's work she one amazing artist. You and Shelly are too much!! ( yes I saw her pumpkin too !) Boy if that's what happens to you in a funk... as they say in my neighborhood " I'm scared of you... " ! Jim this is A.m.a.z.i.n.g. !!! Slump....really...I think not!!! This is just the most coolest pumpkin I've ever seen! There's just so much to look at...a feast for the eyes. I love it! Jim I love this!! Love the mostache too !! Jim, I love your dylusions, I love your mechanical pieces, I love your boxes, but I love it the most when you get all punked out on us! I was feeling the same way yesterday afternoon. I think it is the coming of Fall that does it to me. I'm glad you found your mojo. I think the bottle brim on the hat is just genious! And I do love the mustache too. Hope you are completely out of your funk! He is AMAZING! Love the hat! First, thanks so much for the kind words!! I totally feel the same about you. :) Next, OMG, I am blown away by this!! Your idea-ology stash must be phenomenal - I'm seriously lusting after it. Too bad we don't live closer, I'd raid it! You always use materials in such a unique and original way. This is awesome!! So glad the funk is gone. Jim, your pumpkin is CRAZY COOL! What fun! OMG - you are just amazing!! You never cease to amaze me! This Jack is so awesome!! Aewsomely fun I should say! 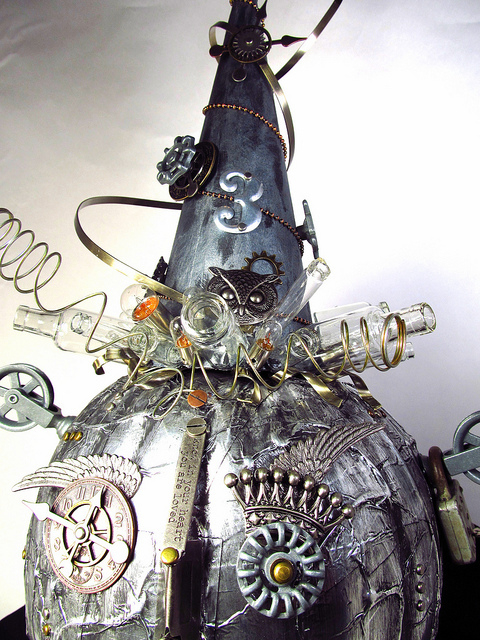 I love the whole thing, but the glass bottles for the witch hat brim is looks fantastic and I like the creepy look of the 'veins' under the riveted patchwork surface. LOL Gotta have creepy with Halloween! you are just as inspirational Jim! pretty sure I too have all the stuff, just not as inspired as you to get it done! Great job Jim...keep 'em coming! She is incredible and so are you!!!! Absolutely blown away!!! Your creativity astounds me. This is amazing!!! Great stash of Idea-ology as well. Hats off to Shelly for getting Jim's mojo working in high gear again! You're definitely an interplanetary visitor! So glad you landed here to share your Out of This World creations! Awesome! Off to check out Shelly's as well. You never cease to amaze me. I would still be unnerved with the scorpion encounter and the tarancula. very cool!!!!!!!!!! 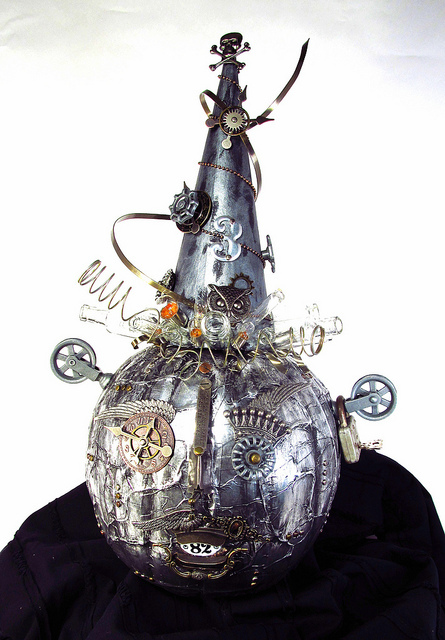 I am not a big steampunk person but I am a think outside the box person. I love this. I do understand about not feeling crafty. Funny how that works. I am glad you found your groove Jim. Now I will have to go check out that blog. Jim, this looks like it walked off a Hollywood Movie set!!! ...something like Dorthoy and the Magic Pumpkin Under the Rainbow. It is SO TOTALLY OUTRAGIOUS! And I love the name you gave it.....Jacked Up Jack! Be sure to create next time you are under the blue spell! This is my grandsons' idea of a "jack'o'lantern".....they will love the alien look! One question.....what is the flat ribbon looking metal and where did you get it? I 'gotta' get me some....so many possibilities...thanks for the inspiration as always. Jim, you are just what the doctor ordered! 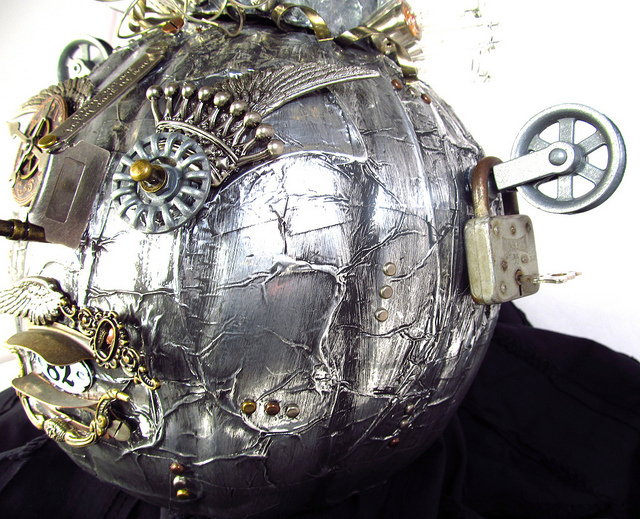 I entered a pumpkin decorating contest and had already decided on a steampunk theme and had two stellar ideas--then nothing whatsoever! Thanks a million for your fantastic creation, but even more for sharing your slump and how you got out out it by seeing inspiration elsewhere. AND for sharing your inspiration in Shelly's work. You are the greatest! Love your incredible Jacked Up Jack! Another fantastic project, I just love this little guy, he is so fun! I'm so glad I found your blog! Wow - are you sure you embellished this enough?! Is there anything left in your ideology stash now? Glad you found your mojo again (must have been that nasty scorpion's fault). 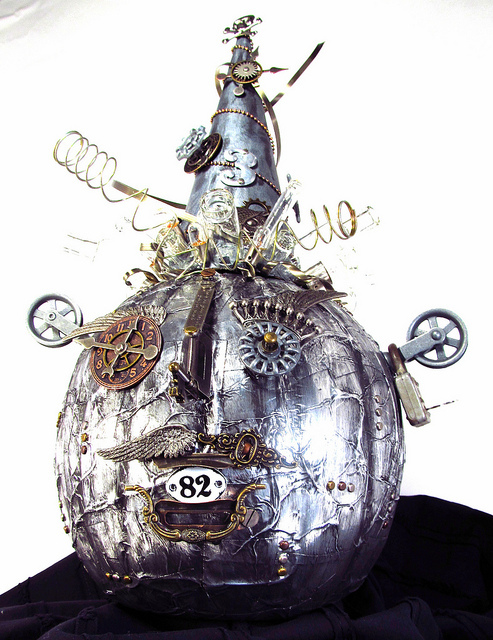 Love your Tin Man/Jack O'Lantern mash up! I wish I could create like this after being in such a slump. As usual you knocked it out of the park. Outrageously creative. Love it. 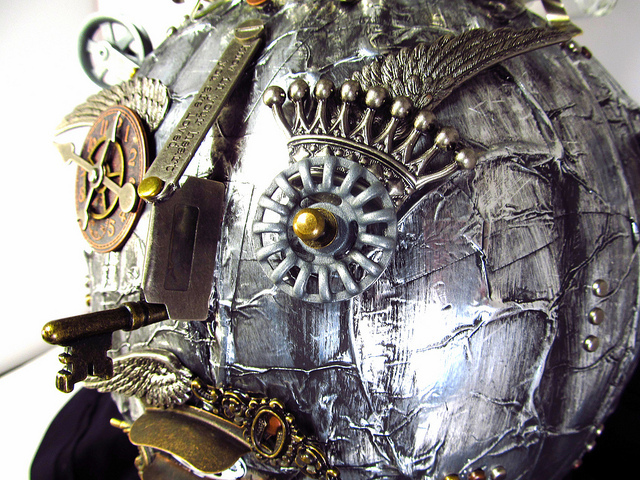 Love those steampunk punkins! Too funny! Hmmmm....what do I have in my Stampunk Stash that would work...hmmmm. Wow! She really inspired you! I love your creation, it's beautiful. Glad you got over your blues! Adore the this project and the leaves on your blog. Got to love fall. WOWSER!!!! you blow me away....you must have a tickle trunk(a la Mr. Dressup...from my childhood) and out come these amazing projects that take a persons breath away...love your pumpkin and your bus and cant wait to see what comes out of your magic craft room next....thanks so much for sharing. Love me some JACK! This looks awesome! Oh this is a true treat! Love every little detail and embellishment! The eyes, the ears what a real hoot! You rock! I totally agree with all of the above, first Shelly is outstanding...and your mojo is back better than ever...so glad you can punk up the pump!!! It's the greatest! !